Through the eyes of a child…. Recently I came across a few photos from Christmases from my childhood….some from my first Christmas, and a few when I was probably five or six years old. Aside from thinking about how different my mom’s living room looked back then, I couldn’t help noticing the Christmas tree in the background, and thinking…did it really look like that? Thinking back on those Christmases past, I still picture those trees in my mind, really big and fat, and smelling like, well, Christmas! There was a special scent in the house once the tree was put up. And I so enjoyed sitting in the living room at night with the only lights being from our tree. Through my child’s eyes I always thought each one was more beautiful than the previous year, but looking at the photos I’ve found, they really weren’t all that spectacular, compared with the ones we decorate today. Christmas time certainly seemed a lot simpler when we were growing up. Because almost all of us used fresh cut trees, we’d wait until almost the week before Christmas before putting it up and decorating it. My mom and dad would move the old floor model radio that was in the corner of our living room by the fireplace to make room for the tree. Daddy would bring the tree home on top of his car after work, and set it in a bucket of water on the front porch until it was time to bring it in. Then he’d set to work sawing the bottom of it just right so the tree would fit in the stand. He’d put it in the corner and adjust it until it was straight, and then fasten a piece of string around the center and tie it to a nail in the wall, just in case it tried to topple over. And after it was up we had to make sure to keep water in that stand every day, or the tree would start drying out and dropping its needles all over the floor. After the tree was in place, my mother would bring out the boxes of ornaments and lights, and we’d finally get to start decorating. We’d start with the “bubble lights” with their colored liquid that would bubble up as soon as the lighted bulb in the bottom of the base got hot, and then add big round snowball lights that looked like they were coated in colored ice. And of course there were strings of plain fat lights in different colors that got really hot, and would burn your fingers if you accidentally touched them. Because we didn’t have as many ornaments as Ben and I do today, we’d make sure we placed each one carefully on just the right branch; certain ones needed to go close together. Why? I have no idea. They just did. And we carefully placed the delicate glass birds that had been my grandmother’s in a place of honor, so everyone could see them. 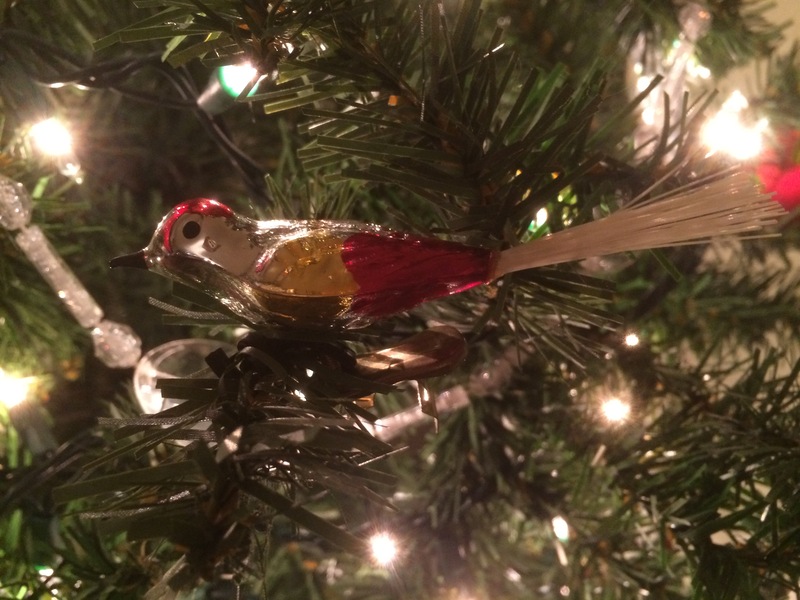 I actually still have those birds, and still use them every year. And who can forget those skinny silver icicles we used to throw on the tree as a finishing touch? The first ones I remember were real aluminum, and sometimes broke when you took them off at the end of the Christmas season. We’d always try to save them for the next year, but they didn’t survive very well. In later years they were made of some shiny synthetic material that stuck to everything…including our hands…when we tried to throw them on the tree. Even though they weren’t the easiest things to use, we still had to use them. The tree wouldn’t be complete without them. Then we’d hang our stockings on the fireplace mantle, very carefully, s o the tacks wouldn’t make too big a hole in the wood and mess it up. 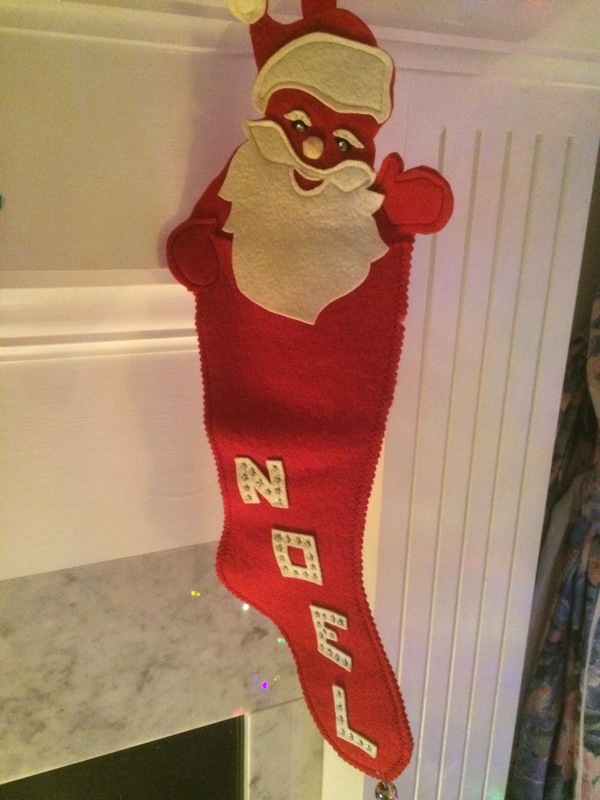 I had a red felt Santa Claus stocking that my aunt had made for me, and my mother had a matching one with “MOM” on it. I still hang mine up with our newer ones, even though it doesn’t get filled. (Although this year it just might find a few stocking stuffers in it for our new granddaughter, even though she isn’t here yet to appreciate them!) My mom would add some sprigs of fresh holly that she’d cut from the woods behind our house, and a few candles, and we were ready for Santa Claus! Yes, I’m nostalgic for those days in the past. I don’t have a lot of memories of Christmas with my dad, since he died when I was only eight. But I remember the huge smiles on my parents’ faces when I’d come into the living room on Christmas morning, finding the cookies and milk gone, and all sizes of wrapped boxes under the tree, just for me. And there was always some piece or pieces of doll furniture my dad had made for me in his basement workshop, just like Santa Claus! It was truly a magical time, or so I thought. But life goes on, and the memories of those long ago Christmases have become just that…memories which hide in special places in our minds where we can relive them briefly. But only briefly, because they tend to fade as they’re replaced with newer ones. And in those memories, we can once again enjoy Christmas through the eyes of the little child we used to be, and for a brief moment, forget the years that have intervened, and still smell the fragrance of that brightly decorated tree…. Yes those memories of yesterday years!! We can never forget our childhood Christmas memories.